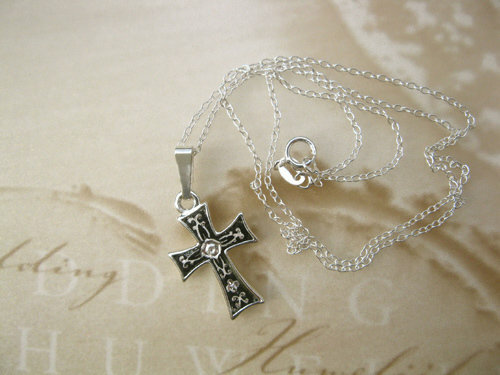 This very striking and special, sterling silver-inlaid cross is handcrafted in the damascene process in Toledo, Spain. The damascene process etches arabesque or geometric designs into steel and then inlays gold or silver wire until the gold (or silver) has penetrated into the cuts so as to finish the intricate design. The damascene jewellery piece is then 'blued' to produce a black background by oxidation of the surfaces which are not damascened. These jewellery pieces are something special and of the highest quality, made by artisans employing age-old techniques that date back centuries. Gift one of these special crosses to a friend or loved-one to pass on your best wishes and make them feel appreciated. Description: The cross (which hangs on a fine 925 silver trace chain) measures 28mm in length including the hanging bail by 15mm wide. The gift is beautifully packaged and contains an information card about Damascene jewellery from Toledo, Spain. The chain is an 18" sterling-silver trace OR there is also a 20" option available. Inspire your friends / loved-ones with this very special Cross. Ideal Easter, Communion or Christening present, a get-well gift, or even a small gift on a friend's Engagement or Wedding Day. Comes gift-wrapped, like all our presents (with an information card) - and we can add a personal message on your behalf. Beautiful.